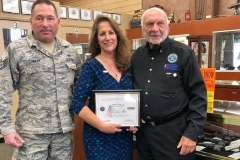 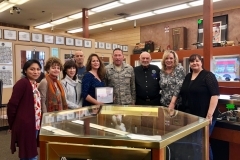 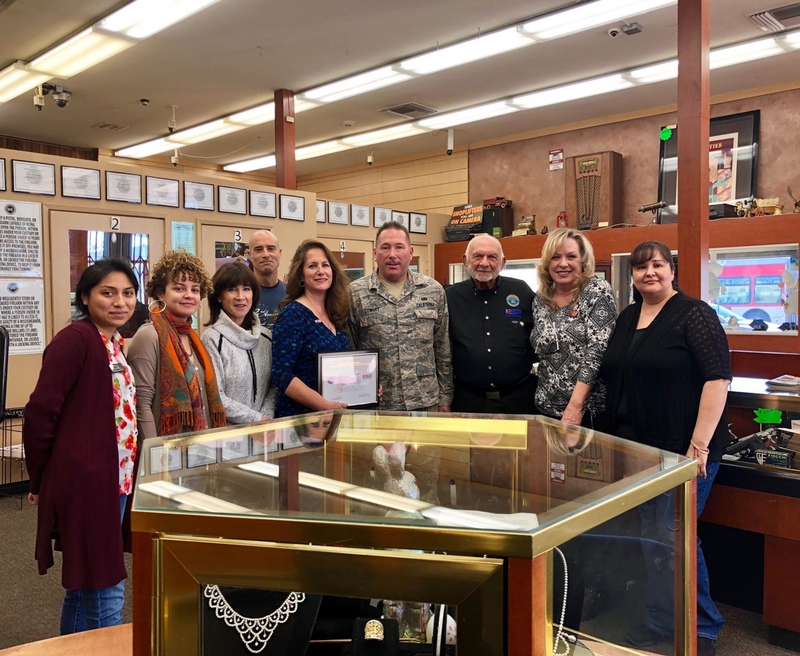 For offering outstanding continued support to Senior Airman SrA John Cowart, ANG throughout his devoted service to this country, our own Diane Taylor of Traders Loan and Jewelry has been graciously awarded the Patriot Award. 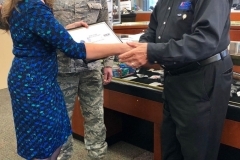 The Patriot Award is a privilege bestowed upon only the most remarkable civilians; people who go above and beyond to accommodate the many challenges that come with employing dedicated National Guard or Reserve service members, including offering flexible schedules, familial support, and other selfless considerations on their behalf. 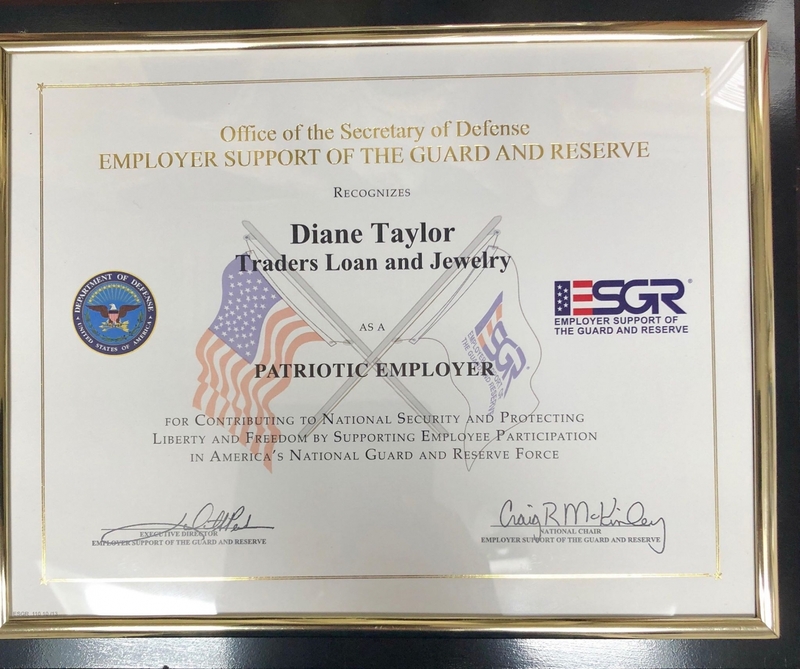 Although we have never and will never seek praise for our efforts and attentions to the needs of our hardworking employees, we’re still so beyond proud to be recognized for such an incredible honor. 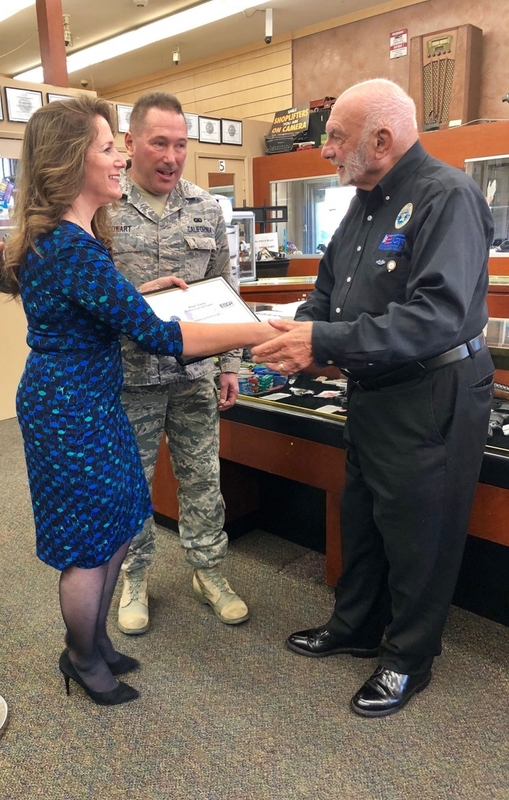 The heartwarming moments experienced during and following the effectively brief ceremony will forever serve as a constant reminder of the strides we must all take to show our care and support to not only the people deemed worthy or special, but to all our fellow men and women. 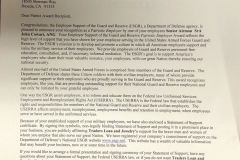 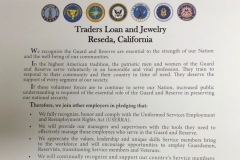 Best of all, in addition to our encouraging, yet unexpected achievement, we now have the pleasure of displaying an official Statement of Support outlining our unceasing commitment and admiration for all service members, current and retired, from every branch of our nation’s armed forces. 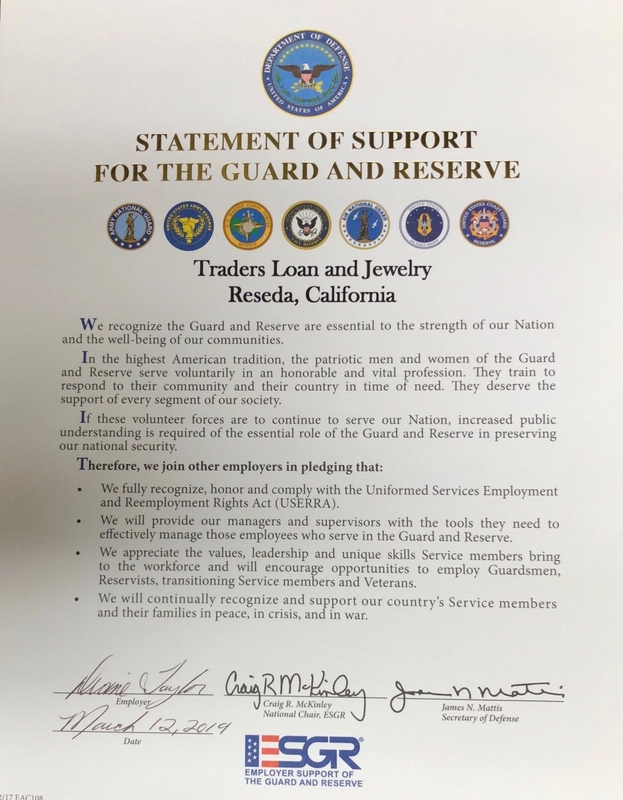 As we continue to uphold our pledge to “fully recognize, honor and comply with the Uniformed Services Employment and Reemployment Rights Act (USERRA),” “provide our managers and supervisors with the tools they need to effectively manage those employees who service in the Guard and Reserve,” “appreciate the values, leadership and unique skills Service members bring to the workforce,” and “continually recognize and support our country’s Service members and their families in peace, in crisis, and in war,” we look forward to seeing the substantial impact we can have, both within our organization and our surrounding community. 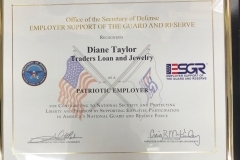 At Traders Loan and Jewelry, we have an extraordinary respect for all the brave men and women who would choose to willingly lay down their lives for our independence. 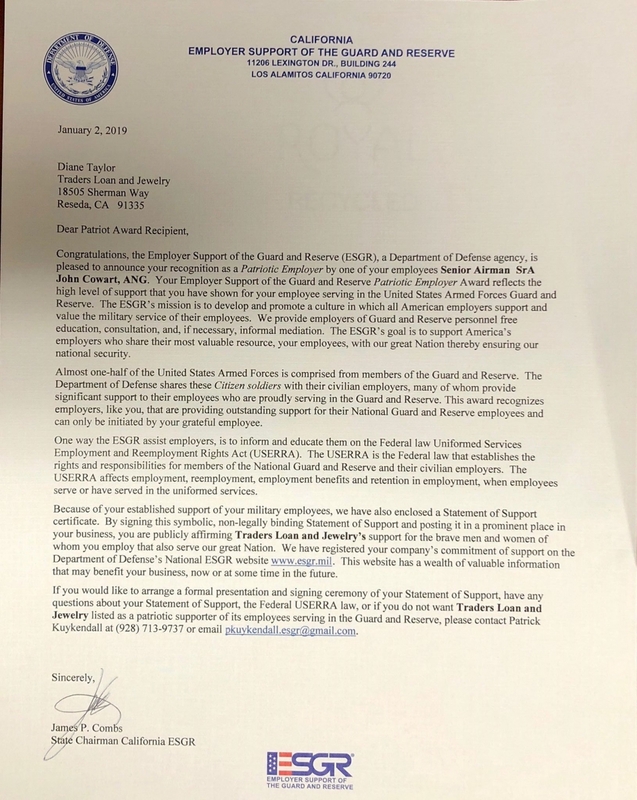 Our continuous support goes out to them and their families as they continue to make difficult decisions each and every day to protect our country. 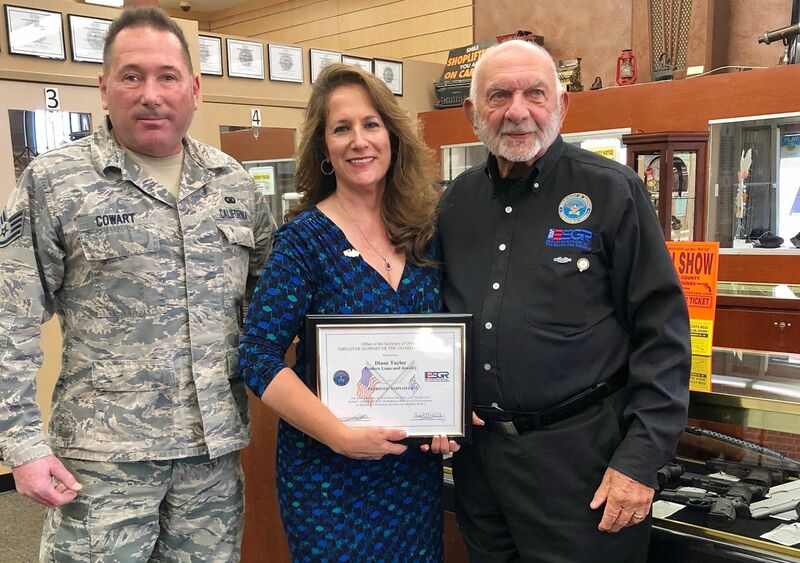 And, overall, if there’s one thing this truly magnificent experience has taught us, it’s that we can’t wait to keep doing more to show how much we care about, and appreciate the courageous men and women who never cease to defend our freedoms.